Quick update before the weekend. Hey y’all. I figured I post something to keep the ol’ blog alive and to let you know about some beer related events that have happened or are happening soon. Last night I went to Woodruff’s third cask night at the Downtown Grill and Brewery. Brewer Dave Ohmer dry hopped 15 gallons of their White Mule Pale Ale and naturally carbonated it for 3 weeks. Poured with an authentic hand pumped beer engine, the brew was smooth, creamy and very hoppy. There weren’t as many people in attendance as the 1st cask night, but it was good to see my friends the Knox Beer Snobs in the house. I also got to kick it with a few of homebrew club members as well as some other great folks. I’m greatful for the Brewery’s cask night and hope that it continues to florish. Speaking of breweries, Marble City Brewing Company’s tap room, The Quarry, is open. They are open Wednesday through Friday from 4-8 pm, Saturday 2 to 8. If you find yourself out and about in Knoxville, I suggest you check it out. I went on opening day. It’s a nicely redone room, very comfortable. It’s a small scene there and everyone knows almost everyone. I met a few new friends that night including a fellow homebrewer. I also went and hung out a little bit with Brewmaster Jen who has a wealth of brewing knowledge. It seems like everytime I have a beercentric conversation with her, I learn something new. The Quarry is having it’s “official” grand opening on Friday October 21 from 4-9 pm. I have volunteered to work the brewer’s keg check in at World’s Fair Park for the Knoxville Brewers Jam that night, but I might have to push that back a bit so I can at least make an appearance. OH, and speaking of Brewer’s Jam, LAST CHANCE TO BUY TICKETS. I hear that there are less than 100 left and they expect it to sell out by Friday evening. Get them now, or miss out entirely. Oh Saturday, how I look forward to thee. 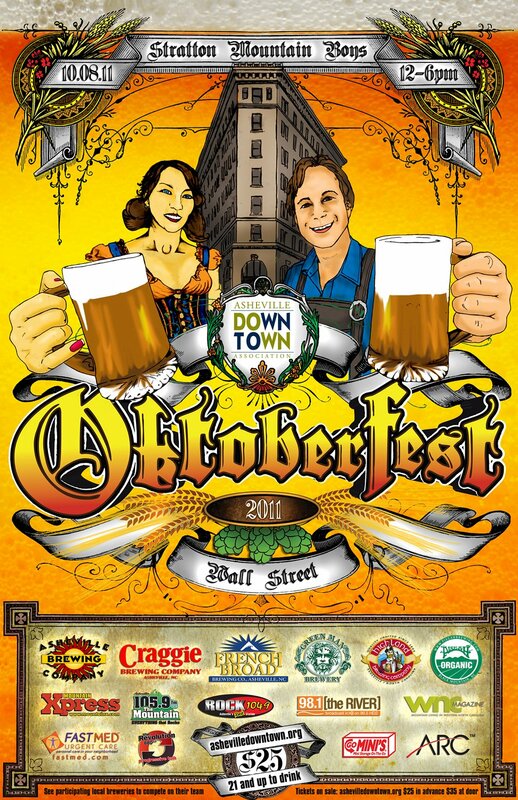 I plan on getting up bright and early to head to Asheville for their small but fun Oktoberfest celebration downtown. Six great Asheville breweries, games, the music of Stratton Mountain Boys, the food, the dirndls, a hotel within stumbling distance and a planned trip afterwards to The Wedge Brewery? OH HELL YES!!!! This is one of the events I planned to go to since last year. The hotel was booked months ago and I made sure to get my ticket way before any chance the event would sell out. I’ll make sure to take plenty of pictures and video and write up a nice long post afterwards. I’m still traveling solo, so if anyone wants to go, give me a shout. Well I’m kicking myself for not going to the homebrew shop yesterday. I meant to get a new bottling bucket so I could sanitize it with the bottles for my last 10 gallons of my Butternut Squash ale that I plan on bottling tomorrow. Wednesday is the only day that Harry closes shop, so I guess I’ll use my old worn out bottling bucket that needed to be replaced along time ago. I still need to work on my next recipe for chocolate pepper stout. Must order ingredients next week. I have to get at least one more brew day in this month. Ok, well, I’ll be tweeting live from Oktoberfest this weekend, so for drunken hilarity, check back and read the twitter side bar on this page. Should be entertaining…. This entry was posted on Wednesday, October 5th, 2011 at 16:23 and is filed under Beer, home brewing, Oktoberfest, party, seasonal. You can follow any responses to this entry through the RSS 2.0 feed. You can leave a response, or trackback from your own site.